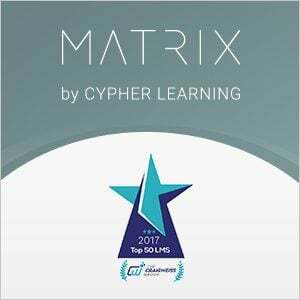 MATRIX, the simple, powerful LMS for businesses from CYPHER LEARNING, is among the Top 20 LMSs for 2017, according to the “Top 50 LMS 2017 Rankings Report” written by Craig Weiss. MATRIX, the LMS for businesses from CYPHER LEARNING, is among the Top 20 LMSs for 2017, according to the “Top 50 LMS 2017 Rankings Report” written by Craig Weiss, the author of the Elearning 24/7 blog and e-learning industry analyst. To gather the data for this report 1,000 systems around the world were explored, using a vast range of criteria including: learning environment, mobile, social, reporting, learner functionality, capabilities of the system, training/support, and more. This year’s report offers a valuable insight on the LMS industry trends, evolution and outcomes. MATRIX is an LMS for use by businesses that that is known for its intuitive user interface, extensive feature set, and strong return on investment. Combining knowledge gained from years of experience working with organizations from different industries, MATRIX provides a complete solution that incorporates all the tools trainers and learners need in their activities. With MATRIX it’s easy to create great courses that learners will enjoy anytime, everywhere. MATRIX offers a centralized environment for creating content, delivering online trainings, evaluating learners’ performance, covering administrative needs associated with trainings, increasing revenue through selling courses, and allowing users to collaborate. MATRIX provides a large range of innovative and indispensable features that make online trainings more efficient such as: integrated e-commerce functionality, graphical course catalog, beautiful module layouts, gamification, rules engine, learning paths, drip content, a customizable portal, web conferencing, collaboration tools, and more. MATRIX is a world class, award winning LMS for use by businesses. The platform is known for its easy-to-use and beautiful user interface, comprehensive set of innovative features, and pricing that provides great value for money. MATRIX is a product of CYPHER LEARNING, a company that specializes in providing e-learning platforms for organizations around the word. CYPHER LEARNING products are used by over 20,000 organizations, supports 40+ languages, and have millions of users.